Some of the early Jewish communities in what became Orange County, California (in 1889) were substantial. Morris A. Mendelson, his brothers, and his sisters were born in Calish, Poland. Morris A. Mendelson was a merchant/tailor with a store on what is now Lincoln Avenue. In 1874, Morris was one of the three men who conducted the first High Holy Day services in what is now Orange County. In 1878, he was one of the five men who incorporated the Anaheim Hebrew Cemetery Association. His activities received attention in the press over the years, with his social, religious, and business life being mentioned regularly. Max Mendelson was made a citizen in St. Louis in 1861. 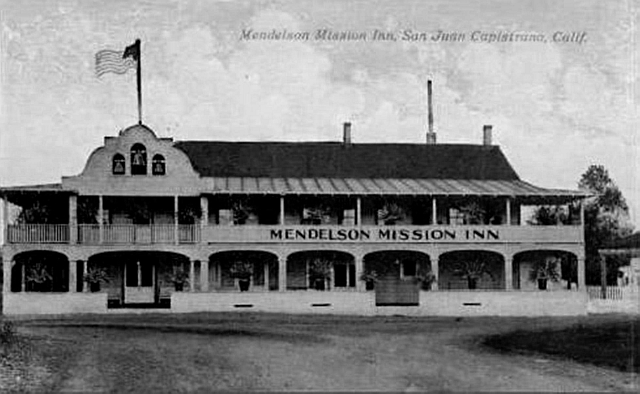 Max and his family moved to San Juan Capistrano and built the Mendelson Mission Inn. The Inn stood until the middle 1930s. Max and his wife, Clara, had seven children. Morris and Max’s families stayed in close contact throughout the years. Louis Mendelson was in business in Anaheim in 1870. In 871, he moved to Baja California, becoming the region’s first known Jewish settler. 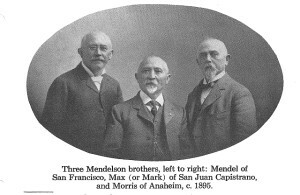 Mendel Mendelson lived in San Francisco. There were five Mendelson sisters: Helena, Rachel, Libby, Lena, and Hannah. Rachel Married Philip Davis in 1864, and Helena married Gustav Davis in 1873. Philip and Gustave were brothers and early pioneers of the city of Anaheim. “Two Orange County Pioneer Families: Mendelson and Davis,” Western States Jewish History 44/3&4.